This oil by Arthur Parton has been in my mother’s family for 80 years or so. Though they aren’t serious about it any way, shape or form, my parents have amassed a nice little collection of art that includes watercolors, oils, sculpture, pastels and prints — none all that expensive or valuable. Since my maternal grandfather’s death in 1984, a nice little oil has hung in the front hall of my parents’ house. He’d inherited the painting from some distant cousins in the late 1920s or early 1930s and my mother, his only daughter, kept it after she broke up his house. We’ve never given it much notice. Earlier this summer, spurred by the appearance of a Jasper Cropsey painting on “Antiques Roadshow,” I decided to check our painting out. Before I share the results of my query, let me also say that my parents are also avid Hudson River School fans who’ve probably been to every major art museum in this country. For my own part, there are days when I wish I’d pursued a career as an art historian — my St. Lawrence thesis explored Frederic Remington’s various depictions of Canada. Arthur Parton was born in Hudson, N.Y. and along with his brothers Ernets (1845-1933) and Henry (1858-1933), he wanted to become a painter from an early age. Arthur Parton became a prominent 19th century landscape painter after studying with William Trost Richards in Philadelphia and at the Pennsylvania Academy of Fine Arts and after a trip to Europe where he was highly influenced by the Barbizon painters (1869). In 1872, his view of the Shenandoah River (Virginia) was published in Bryant’s Picturesque America and that publication gave him instantaneous recognition. 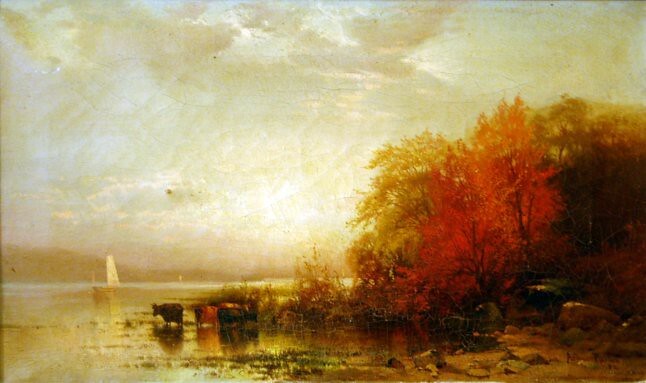 During the reign of the Hudson River School Parton became an Associate of the National Academy of Design (1871) and a full National Academician (1884). 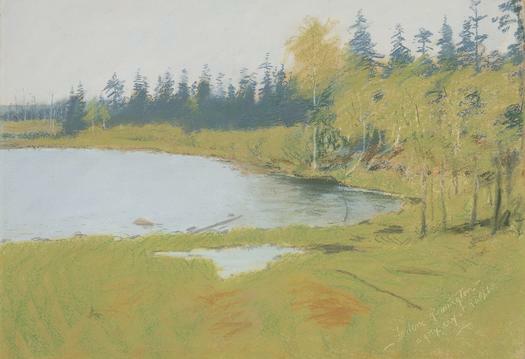 He was a leading member of the American Water Color Society and the Artist’s Fund Society. 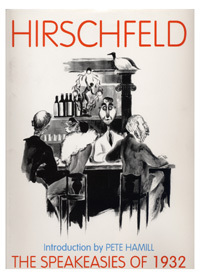 He exhibited at the National Academy (1862-1914), winning a prize at the NAD in 1896; the Corcoran Gallery, Washington, DC (1907, 1908, 1910); Brooklyn Art Association (1866-1885); Philadelphia Centennial Exhibition, 1876; Boston Art Club (1882-1909) and more. Awards include one in New York City (gold, 1886); Temple Gold Medal at the Pennsylvania Academy of Fine Arts (1889); a medal at the St. Louis Exposition (1904) and more. His work is represented in the Brooklyn Institute Museum; the Indianapolis Museum of Art and the Museum of Modern Art, NYC. Parton painted throughout New York state and is known for his paintings of the Catskill and Adirondack mountains. He was a well-known artist and well-liked, having exhibited for over a half-century at the National Academy, and moving from a tight academic Hudson River School palette into Impressionism. From 1874-1893, he maintained a Tenth Street Studio at 51 West 10th Street, alongside William Merritt Chase in New York City, and he probably was highly influenced by Chase’s impressionistic canvases of Shinnecock. We’re in the process of having the piece appraised. Stay tuned! “A Grey Day at Ralphs,” an 1896 pastel of a northern New York scene by Frederic Remington. Image courtesy of the Frederic Remington Museum, Ogdensburg, N.Y. The Frederic Remington Museum, a fantastic cultural institution in northern New York is opening a new exhibit on Saturday, Sept. 25. The show, titled “Frederic Remington Favorites,” features Remington works selected by people with various connections to the museum. I was one of the selectors. Laura Foster, the museum’s curator, reached out to me this summer and asked me to participate. Laura and I worked closely together in 2001 and 2002, when I was researching my senior thesis at St. Lawrence. “Frederic Remington’s Canada,” which earned me honors in the History Department, explored how Remington brought images of Canada — mounties, Blackfeet traders, French pioneers and other archetypes — to wide American cultural awareness. Though Frederic Remington traveled widely across the American and Canadian wests — journeys he documented ad infinitum — the North Country never escaped his imagination. And so I settled on the simple pastel, “A Grey Day at Ralphs,” which the artist created around 1896. An hour of cursory research leads me to believe that the scene was discovered on property either rented or owned by the artist’s good friend, journalist Julian Ralph. Regardless, the image is certainly a North Country scene. We know that Remington was in the region for the better part of the summer of 1896. 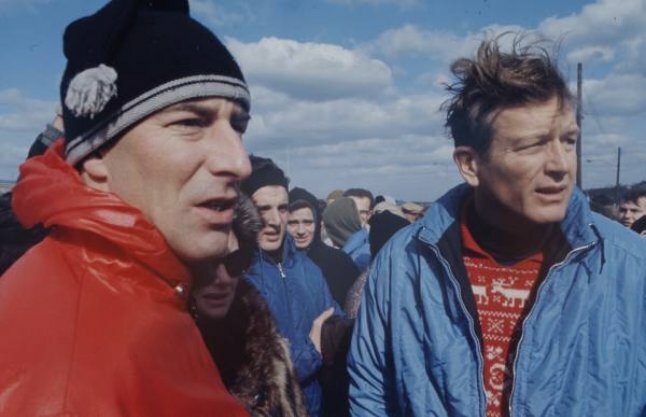 In May of that year, he took a two-week canoe trip on Lake Champlain. Later in the summer, he traveled the region making pastels. “A Grey Day at Ralphs” is an interesting bridge between the charming “Small Oaks” of 1887 and Remington’s later impressionistic studies. Among my favorite of these are the Pontiac series of 1909 and “Boat House at Ingleneuk,” a 1907 work. While I didn’t grow up in the North Country as Remington did, I feel a similar affection for the region. I spent my collegiate life in Canton and then spent five years as a journalist in the Tri-Lakes area. Though my career has taken me south to Westchester County — Remington lived in New Rochelle, a mere three miles from my current home — I catch myself dreaming of North Country scenes, like “A Grey Day at Ralphs,” nearly every day. Steve Hann of Saranac Lake, an ejforbes.com reader we’ve featured before, wrote me over the weekend to suggest “A Gray Day at Ralphs” may have been created during a visit by Remington to Ralph’s on Upper Chateaugay Lake. I consulted “Frederick Remington, Selected Letters,” a collection of the artist’s correspondence assembled by Allen and Marilyn Splete. None of the letters the Spletes appended would support Hann’s theory, but I’m going to do my best to check it out. 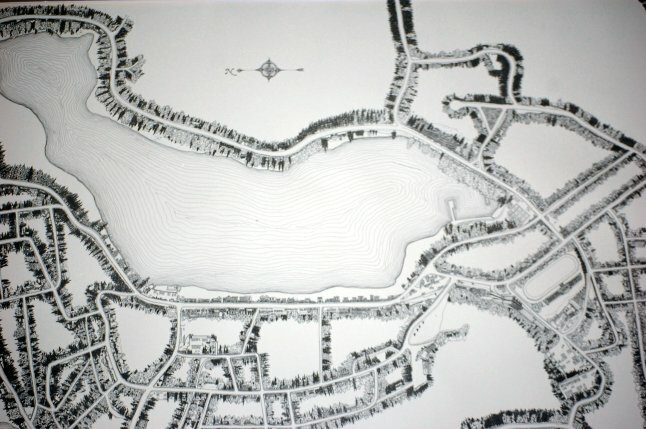 The exhibition runs through Sept. 10, 2011. President John F. Kennedy, left, confers with McGeorge Bundy while Ken O’Donnell talks with an aide during the 1962 Steel Crisis. ‘Naval Battle Between the United States & The Macedonian on Oct. 25, 1812′ by Thomas Birch, 1813, which hung in the Oval Office during the Kennedy presidency. Images of the Oval Office, as it was decorated during the presidency of John F. Kennedy, are etched indelibly on the American mind. The president’s rocking chair, the photo of John F. Kennedy Jr. peering through the opened front panel of the Resolute Desk, the scrimshaw, the Harvard captain’s chair and the plaque that read, “O God, Thy Sea is So Great and My Boat so Small,” are all iconic relics of the abbreviated Kennedy presidency. 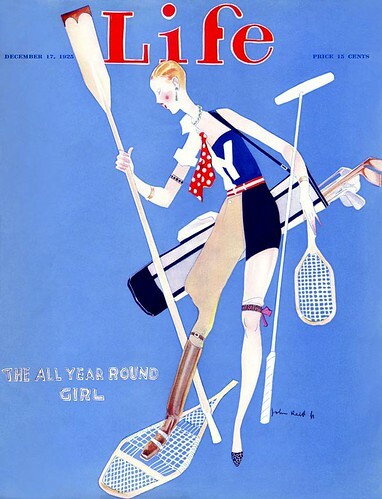 Few of those images, however, pay much tribute to the art Kennedy selected to hang in his office. 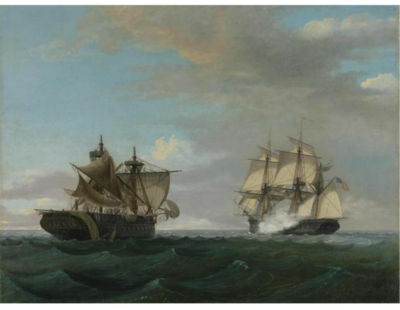 Largely comprised of images that depict important naval battles of early American history, the collection also included two paintings by George Catlin. In college, I spent part of a summer as a fellow at the Buffalo Bill Historical Center in Cody, Wyo., studying American art of the West, in particular the work of Frederic Remington. Among the BBHC’s collection is a good amount of George Catlin’s work, which fascinated then as now. Catlin, born in Wilkes-Barre, Penn. in 1796, left the law to take up travel writing and painting in the American west after observing an Indian Delegation in Philadelphia. His first trip was with Capt. William Clark in 1830. At least five more followed and when he returned east in 1838, he assembled his paintings in a collection he called his Indian Gallery. The works are iconic and are considered the foundation of a long tradition of Western art that carried forward through Thomas Moran, Alfred Bierstadt, Remington and Charles Spielvogel. 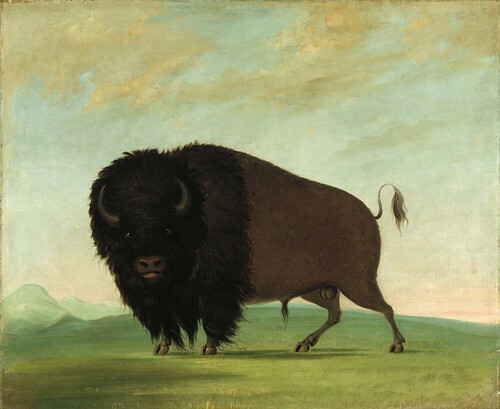 Two of Catlin’s Indian Gallery works were hung in Kennedy’s Oval: “Buffalo Bull, Grazing on the Prairie” painted in 1832-33 and “Buffalo Hunt under the Wolf-skin Mask,” also painted in 1832-33. Both are now in the collection of the Smithsonian. • “The White House Long Ago” – Watercolor of the White House by Jacqueline B. Kennedy (on table and desk) now in Jacqueline Kennedy exhibit in the Museum. A student room at Yale’s Lawrance Hall, photographed during the 1880s. In my Canton days, I was more than a little obsessed with making our accommodations there both comfortable and interesting. We had a huge collection of furniture, flags, banners, prints and even taxidermy on the walls of 33 E. Main St. when Lavin, Leifer, Furnary, Johnny and I were renting the place. We joked at the time that it had the feel of an upscale Bennigan’s. But we loved it all the same. 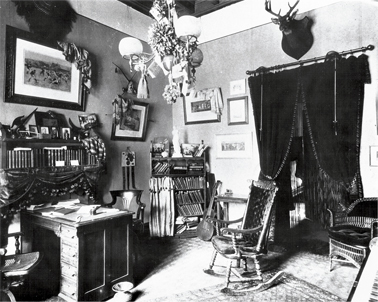 Clarke, who departed Canton before the advent of 33, still visited us and his memory was apparently jogged when he came across an interactive for “There’s No Place Like Home: Student Rooms at Yale, 1870—1910,” an online exhibit at the Yale Art Gallery. That distinctiveness is evident in five photographs of student rooms taken in the latter half of the 19th Century. These are hardly the humble cells one might imagine. Austerity is nowhere to be found. In its place are beautiful bookcases and desks, heavy formal drapes, framed prints and photographs, taxidermy, musical instruments and sporting accouterments. Though I often find Victorian furnishings to be a bit over the top, I want to spend time in these rooms. They each convey a sense of comfortable, lived-in warmth. Coupled with the photographs, which come from the Sterling Memorial Library’s Department of Manuscripts and Archives at Yale, are images of pieces from the Yale Art Gallery’s Department of American Decorative Arts. These objects correspond to pieces on view in each photograph. Remarkable find, Clarke. Thanks for passing it on. The 2009 Saranac Lake Winter Carnival Pin, designed by Saranac Lake native Garry Trudeau. Image courtesy of the Saranac Lake Winter Carnival Committee. Cartoonist Garry Trudeau’s design for the 2010 Saranac Lake Winter Carnival pin has been released, the Adirondack Daily Enterprise reports. 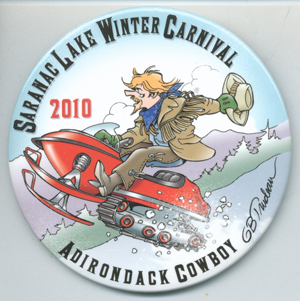 Featuring Doonesbury character Zonker riding a snowmobile in cowboy gear, the pin celebrates the 2010 Carnival theme: Adirondack Cowboy. The pin is Trudeau’s 29th design for the annual estival. A native of the Little City, Trudeau is a faithful supporter of its annual Winter Carnival, a week-long festival that celebrates the longest season. The pin is Trudeau’s 29th design for the annual estival. Held annually since 1897 in the first week of February, the Carnival features an ice palace, competitions in every winter sport imaginable, as well as woodsmens’ demonstrations, the coronation of a King, Queen and royal court, copious parties and an unrivaled parade. Does your little town have a female dance troupe whose moves are choreographed with folding lawn-chairs? I don’t think so. It’s basically “Waiting for Guffman” on ice. People speculate that Christopher Guest is working on a script. It’s that American. Each year, the Carnival is themed. When I was an editor at the Enterprise, my favorite themes were 2003’s Mardi Gras and 2005’s Adirondack Aloha. 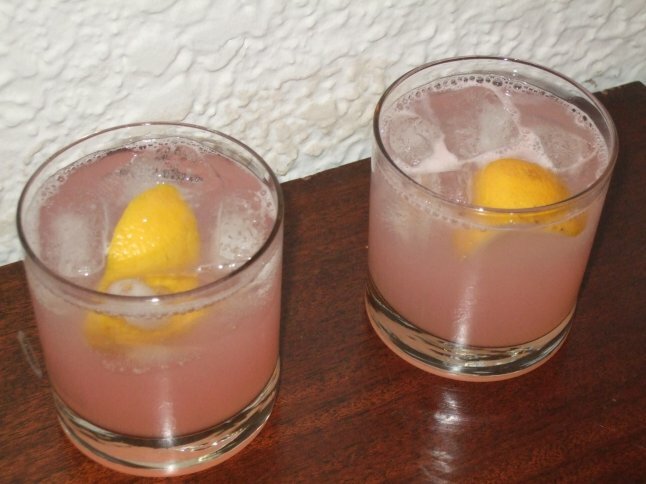 Both were rollicking good times. Highlights included the annual parade party held by my good friend, Ned, and later, in the same apartment by ejforbes.com’s favorite children’s author, Maxwell Eaton III and his fiancee, Kristin Sadue. These events were always deeply and hilariously strange. For much more on the 2010 Winter Carnival, which runs from Feb. 5 to Feb. 14, 2010, visit the Carnival Committee’s official site.